This never used purse was purchased in the mid-1990s. 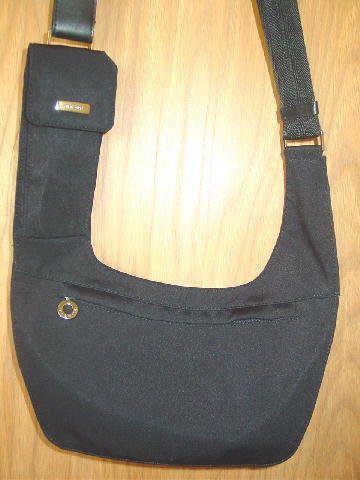 It's in black with a black 32 1/2" by 1 1/4" shoulder strap which has a double textured cordlike appearance. 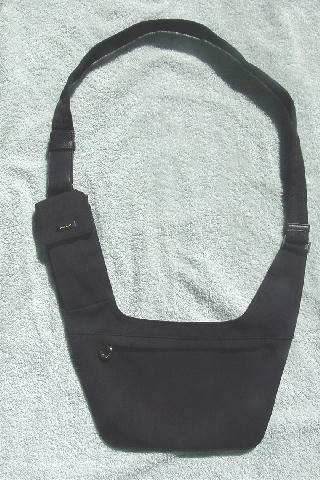 The shoulder strap has a black faux leather lower strap (with interior velcro) which attaches to itself above the eyeglass compartment, which also has a velcro closure. The front has a zippered horizontal closure with a silver-tone ring pull with Nine West etched in it. It has a very dark gray fabric lining. She bought 2 in each color for a travel magazine photo shoot. top of eyeglass compartment to bottom of purse 13 1/4"